I for one welcome our new public-transport-loving overlord. It’s great that — unlike Tony Abbott — we now have a PM who understands the importance of public transport, as well as other issues such as carbon emissions — though Turnbull has notably said he won’t be changing the government’s stance on the latter. 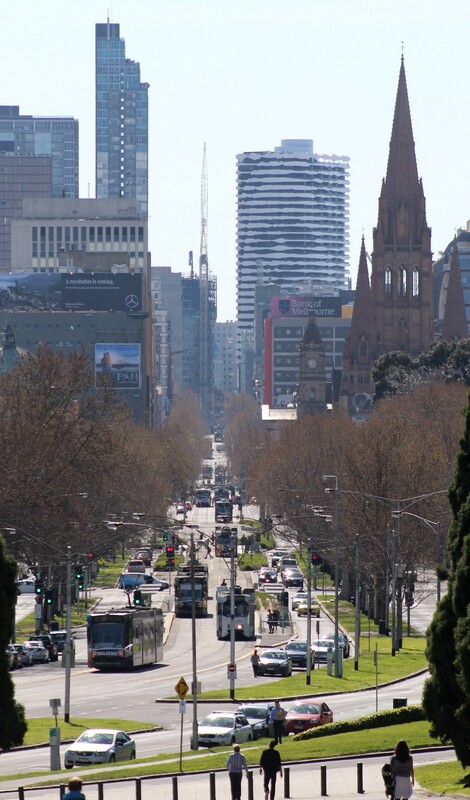 Here’s a view from later on Friday, around lunchtime, looking north along St Kilda Road and Swanston Street. For those who aren’t local, that black and white building forming a face is the William Barak building, named for the elder of the Wurundjeri, traditional owners of this land. This corridor will change markedly in the next ten years, partly aboveground, partly underground, as the Melbourne Metro tunnel gets built. In the short term particularly, much of Swanston Street will be re-routed and closed during construction. Perhaps with a new PM who is not so roads-focussed as Abbott, it might even get Federal funding. A great photo of Melbourne. I’d never noticed the face on the William Barak building before. I guess you need to look up! Roger, Yeah I was going to say “who is the face on that building”. Interesting. I never knew that building had a face in it. I’ll have to tale a closer look at it in person sometime. The camera angle is interesting too. I pass by there on the tram almost every day and everything in the photo is familiar but the angle and height of the shot gives everything a different perspective and makes the things in the photo seem closer together than they really are. There is no doubt that the new PM would be great for public transport.